A national group of plant pathologists, including Pierce Paul from The Ohio State University, will be presenting a two-part webinar series to help U.S. wheat producers management Fusarium head blight (FHB), also known as head scab or scab. FHB affect wheat, barley and other small grain crops, reducing yield and contaminating grain with mycotoxins such as deoxynivalenol, AKA vomitoxin. 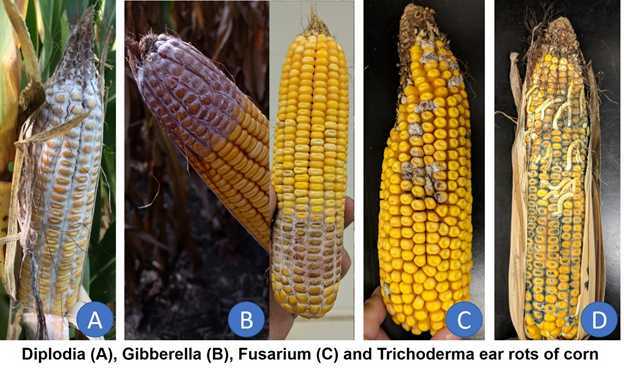 Over the last few weeks, we have received samples with at least four different types of ear rots – Diplodia, Gibberella, Fusarium, and Trichoderma. Of these, Diplodia ear rot seems to be the most prevalent. Ear rots differ from each other in terms of the damage they cause (their symptoms), the toxins they produce, and the specific conditions under which they develop. Foliar diseases, especially Gray Leaf Spot (GLS), are beginning to show up in some corn fields. This is not at all surprising, given that the crop was planted relatively late and it has been wet and humid in some areas. GLS is favored by humid conditions, particularly if temperatures are between 70 and 90 F. Foliar diseases of corn are generally a concern when they develop early and progress up the plant before grain fill is complete. This is especially true when the hybrid is susceptible. In most years, GLS and NCLB usually develop late or remain restricted to the lower leaves. Early Corn Coloration – Green, Purple, or Yellow? Corn seedlings often turn yellow (due to low nitrogen uptake and/or limited chlorophyll synthesis) or purple (reduced root development and/or increased anthocyanin production) under cool, wet conditions. Some hybrids are more likely to increase anthocyanin (purple pigment) content when plants are cool. Yellowing or purpling of corn plants at this stage of development generally has little or no effect on later crop performance or yield potential. With corn now beyond the R4 growth state in most fields, there is really nothing you can do about southern rust in terms of fungicide application. However, correct diagnosis of this disease is still very important from the standpoint of identifying the hybrids that were most severely affected. Although our growing conditions generally do not favor this disease and we may go for another several years without seeing as much southern rust as we did in 2017, we still need to identify those highly susceptible hybrids.